Based on player wishes, these five all-new vehicles bring a new twist to your game! The Tatra 4m tram and Capitol S metro trains are novelties on tracks, and the three new articulated buses offer a pleasant way for the citizens to get around. Tatra 4m tram carries plenty of passengers and is fairly fast. The Capitol S metro train excels in low maintenance costs. Maurice Ikaros bus also has very modest maintance costs, but in addition has a good engine that gives it plenty of speed. It's companions, Arnauld GL and Nova SA, are also articulated and carry a lot of passengers. Where the Nova SA consumes lot of fuel, the GL is more efficient and also carries more passengers. 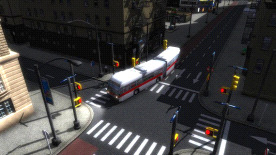 These five fan favourites are sure to take your mass transit fleets to new lengths!